Angelica Bencomo, second from left, introduces several books related to the teen mixology activity. 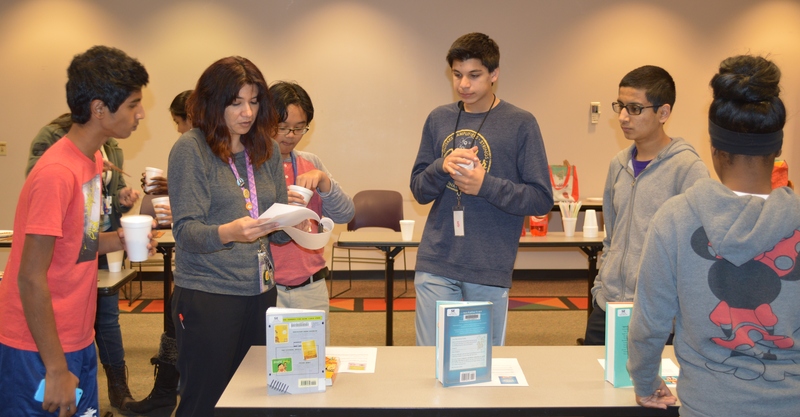 Begin with strawberry juice, add cranberry ginger ale, toss in a few raspberries and finish with a splash of raspberry lemonade, and ta-da—you’ve got the recipe for teen learning at Southeast Regional Library. For Clinton, 12, and Neel, 14, the mixture was an original creation for a drink they named Berry Dragon Punch. Surrounded by a group of students gathered in the library’s community room, Clinton and Neel took a few gulps and declared two thumbs up. They were participants in Teen Mixology Book Talk, a new once-a-month program that in February happened to fall on the first day of the Chinese New Year. Angelica Bencomo, Teen Department library associate, began the session with a discussion of the theme and then introduced corresponding books. Her directive: create a tasty beverage, or mocktail, based on a book or inspired by animals of the Chinese Zodiac. Clinton and Neel found their inspiration in dragons, while others chose from the list Bencomo had provided. Teen Mixology Book Talk began in January and will continue on the first Monday of each month from 4:30 – 5:30 p.m. The program is designed to build creativity, communication and promote reading for pleasure. According to Amber Holley, manager of youth services at Jacksonville Public Library, programs like this emphasize that educational success is not restricted to reading and writing. She strives to help staff design high-interest, developmentally appropriate programs that allow teens to develop the necessary skills to succeed. Nina, 13, who also participated in the mixology program, said she first attended an after-school program with a friend. “It was a lot of fun,” she said. “We were blindfolded and trying to put together children’s puzzles that were all scattered and mixed together.” Part of the fun was working with the other students. To add another incentive, Bencomo offers the teens the chance to earn community service hours if they also join the Teen Advisory Board, which meets the first and third Friday each month at 4:30 p.m. The advisory group plans the programs that take place on the second and fourth Fridays each month. “They’re really good kids, and I want to make it fun for them,” Bencomo said.